Mido – the must-see international showcase in the eyewear industry – will be on stage at the Fieramilano pavilions in Rho-Pero from February 28 to March 2, 2015. Last year’s thre-day Mido event attracted more than 45,000 visitors (20,000 from Italy and 25,000 from outside the country) and counted 1,100 exhibitors from 49 countries, representing all five continents. 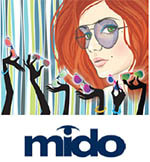 “Over the years, Mido has succeeded in keeping itself up-to-date without losing sight of the importance of its networking value and on-the-field experience,” stated Cirillo Marcolin, president of Mido and Anfao (the Italian Association of Optical Goods Manufacturers) A fundamntal part of last year’s success and positive feedback from participants rested on the reworking of the exhibition layout. That project, initiated in 2014, will continue in the coming years. Mido’s organisers are working on the next edition and the 2015 show promises to be amazing.